The Micro Mini Original is a legendary scooter made by Kickboard USA. This scooter model made for toddlers won many awards at the Nuremberg Toy Fair 2012, including the Parent’s Choice Approved Seal, the Oppenheimer Toy Award Seals for Best Toy, and the Best of Show Award. Toy Report named it the Best Preschool Scooter and Learning Express Stores named it the Best Outdoor Toy. As part of its Best Toys for Summer series, the Micro Mini Original was also featured on the NBC Today Show. No doubt, this kick scooter model is a bit more expensive than its competitors, but you get good value for your money. All things considered, with a sturdy design, the Micro Mini can last for a long time. The scooter comes with a unique learn to steer mechanism designed to help kids to direct the scooter by shifting body weight right or left. For this reason, they can learn coordination and balance. To whom does this product cater? Kids aged in the range of 2 to 5 years old. The Micro Mini scooter has a three wheel system designed to make the ride easier for young children. Two of the wheels are installed in front of the scooter, while one wheel is installed in the back. For this reason, this system makes the ride safe for small kids who are learning how to ride. Accordingly, this three wheel system makes this scooter one of the most recommended for small kids. 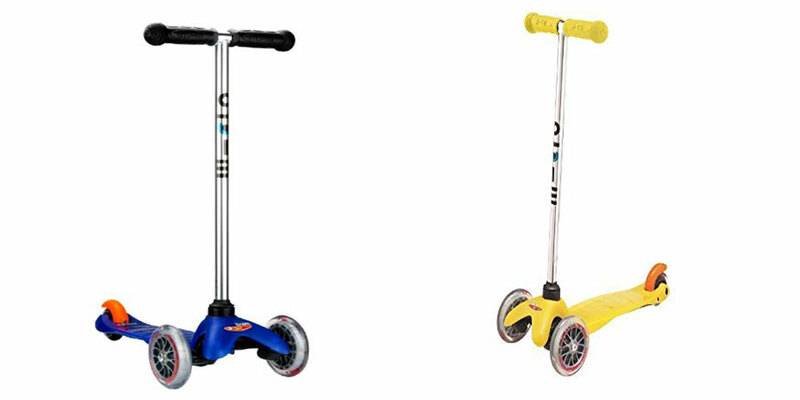 The Micro Mini Original is a high-quality scooter with very intuitive controls for kids. First and foremost, the breaking is easy and all the rider needs to do is to step on the back wheel. Next, all the rider needs to do for turning is to lean on the side. The Micro Mini Original’s wheels are made from a non-marking polyurethane material. For this reason, you can keep using the scooter even indoors. No doubt, your kids will keep getting some exercise even when it is raining outside. The Micro Mini scooter is the perfect choice for kids aged between 2 and 5 years old because it is designed to be very easy to ride. It comes with great safety features and you can purchase it in a great variety of fun color options. The three-wheeled scooter is recommended for beginner riders because it provides much more stability. Being very low to the ground, this scooter is very easy for kids to ride. It is also very easy for them to glide, steer and turn. The assembly of the Micro Mini Original is also very easy. It doesn’t take more than five minutes to assemble the product. The assembly process is intuitive and can also provide a good teaching opportunity for your kid. This is the best kick scooter for kids under 44 pounds and between the ages of 2 and 5. It is well built and also very affordable. It is very durable, fun and easy to use. Since small children tend to lack stability, not being so good with their body balance, it is important that their scooter to compensate for this. The Micro Mini Original comes with a t T-bar design that makes it easier for small children to ride the scooter by leaning right and left. This way, they learn to balance and coordination. The T-bar can be directly adjusted from the deck. Very good wheels suitable for all surfaces. The low to the ground deck and the three wheels system make it easy to ride and very stable for young children. It comes with a unique learn-to-steer mechanism. The steering bar fixed at 24 inches above the deck makes it suitable for kids under 5. On bad weather days, kids can ride the scooter inside, since its wheels are non-marking. Kids can easily maneuver this scooter due to its 4 pounds light weight. The Mini has a modular construction. Soft edges and upright design make it easier to use by small children. It comes with a rear brake for additional security. According to the manufacturer, there is a risk of choking small parts. Therefore, this scooter model is not suitable for kids under 3 years old, even though the ads say it caters to the kids aged 2 to 5 years old. Question: Can you transport the Mini in a car? Answer: The Micro Mini comes with a removable handlebar. So, you can pop it out for easy transport/storage. Question: Does this scooter model have a learn-to-steer mechanism? Answer: Yes, there is a “steering hardware” on the scooter’s underside. Its design allows the kids to curve and carve by leaning their body weight left and right. Question: What is the minimum height to use this scooter? Answer: There is no “official” minimum height. Most kids who are 2.5 years and up are able to use the scooter. The distance from the desk to the handle bar is 24 inches. Question: Is there any difference between Mini and Maxi? Answer: The Maxi’s design is for kids up to 110 lbs, with ages between 5 and 12, up to 110 lbs and a minimum weight requirement of 35 lbs. On the other hand, the Mini is for younger riders with ages between 2 and 5. Question: Is there any difference in features for different color models of the Micro Mini? Answer: No, they differ only by cosmetics/colors. Question: Can I use the O-bar with the Micro Mini Original? Answer: Yes, it is possible to use the O-bar handle with the Micro Mini. Being shorter than the standard T-bar, the O-bar handle allows even younger children to ride the scooter. This scooter model is at the top of the list when it comes to scooters designed for small kids. It is good for kids between 2 and 5 years, and it has many positive reviews. Furthermore, the Micro Mini Original can help your kid to exercise while having fun. It is a great option for a toddler because of the low deck and the 3 polyurethane wheels make it highly stable. Also, the wheels are quite smooth, and the deck is reinforced with fiberglass. Thus, this helps to absorb any shock as the child rides. There is minimal or no impact even on a bumpy sidewalk.